My youngest loves music. He will notice the background sounds of the backup singers on a single. That is a trait I am proud of. One I am significantly less happy about it, is his obesession with electronics. When I return home , he comes to me begging: "Wii mama! Pleeeeease". I have set the rule that he cannot play Wii, the simulation electronic game, without his older brother and luckily for me, his older brother is often busy swimming or memorizing science and poetry. When this same son goes to family gatherings, he wanders from one relative to another asking if they have IPhones. When he went on a field trip with his class to an art gallery, the gallerist turned her computer on to show them slides and he ran to her with the question: "what games do you have on your computer?" We don't have a computer at home. Like our toppling Arab dictators, I have restricted access to social networks like Facebook and Twitter. My eldest received his electronic toys, one year at a time, from age 7, and only upon insistence of my friend. That means my younger children still don't have any DS or PSP to their name. I thought of a "computer class" for the youngest to channel his interest properly. That is what parents in the 80s did. Computer camps proliferated at the time. My brother once spent a few weeks at a computer camp in Cape Cod! 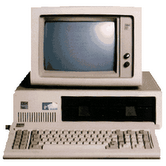 My father had been the first to import the first model IBM PC in 1981 to Dubai. We had to use DOS floppy discs and the huge, heavy box of a computer presented black and white screen with nothing but a single font. Its printer needed special green and white paper which printouts resembled medical sheets. My father encouraged us to try the computer, to practice as we practiced our piano. 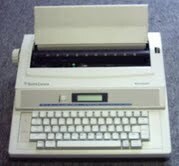 When I went to College, almost a decade later, I was still wary of using computers so I bought a Smith Corrona type writer and typed my college papers on it, with no use of word processing. It barely had a spell check! But I did take a Computer Science class the first trimester, an expression of my fascination with "technology" and "progress". I knew I wouldn't become a computer scientist but I supposed it would be useful one day and I was proud of knowing Basic computer programing language. With much hardship I studied Pascal language in that class. In retrospect that class was USELESS and very much a waste of energy. I practically haunted the teacher's office hours, begging for assistance. Granted, computer programing is a good mind game, requiring ingenuity, logic and organization. But technology moves so fast, that all that knowledge can be filed under "computer science history" at this point. 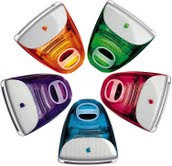 In graduate school, I ventured into Apple computers. I don't quite remember which computer I specifically used to compose and type my dissertation. Suffice it to say, it didn't really matter. Most of my notes were on index cards and handwritten. 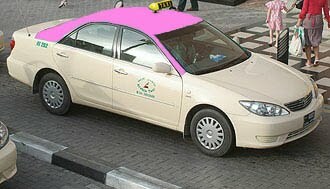 I never used Lexus-Nexus for my research and Google and Wikepedia were barely nascent when I graduated in May 2000, a few months before the Y2K scare. My husband gifted me with a really funky lime-green all integrated Apple desktop computer in 1998. That was followed by a very flat screen desktop Apple hooked to half a sphere of machinery in 2002. I think I would put my first born in his high chair and play computer programs programmed for toddlers. I never did that with my other kids, as I returned to the more traditional games with them. How funny that with all the effort my father put in to introduce me to computers, and I tirelessly continue to teach my children penmanship. I also type my blogs on a BB. I guess Computers and me were just not meant to be! It is true that I was one of the first to invest in a $5000 IBM PC for my kids because I knew that this was the road to the future.I still have the dinasour tucked in my attic at my summer home in France,awaiting a buyer on EBay.Getting it through the French customs at Nice airport was a miracle,since the French antiquated bureaucracy had not seen an "ordinateur" of this model,and considered it a most valuable prize.I left it to my wife,a US citizen to explain to the custom battalion,that it was meant for the benefit of her children who were working on a school project.Fast forward 30 years later,and my toddler grandchildren manipulate the IPods and the Blackberrys better than I do! !